If you want your faith to inform your work, you may be looking into the types of jobs available in Christian leadership. While your first instinct may be to look into jobs within the church, that isn’t the only setting where you can exercise faith-compelled leadership skills. Para-church organizations, schools, colleges, health care facilities and humanitarian organizations are all places in need of strong Christian leaders. The most obvious kind of jobs in Christian leadership are clergy and lay leadership jobs within congregations. Every Christian denomination has its own educational requirements for these various kinds of jobs, but all Christian churches need pastors, deacons, teachers and administrators in order to help the members of the congregation to grow and thrive in their faith and to serve the world around them. In addition to such jobs within churches, you can often find similar leadership roles, though the titles may differ, in para-church organizations. A para-church organization is a Christian based organization, such as a non-profit group or a business, that works ecumenically or interdenominationally. People from different Christian traditions come together to serve a common cause, such as education, missions or social welfare. These kinds of organizations need faith-compelled leaders with the kinds of skills you would find in any such organization, secular or faith-based. A good example of a para-church organization is InterVarsity Christian Fellowship, which promotes and supports student-led Christian ministries at universities and colleges. 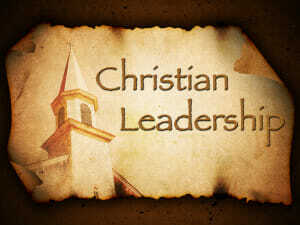 Christian leaders are also needed in the areas of education, health care and humanitarian assistance. If you are interested in teaching in a setting where your faith can intersect with scholarship, you might want to look into teaching in a private or parochial school or at a Christian college or university. The Council for Christian Colleges and Universities (CCCU) has a career center that provides leads to jobs in Christian higher education. In addition to teaching work, college and university campus ministries are often looking for chaplains who can serve the needs of Christian students on campus. Chaplaincy work is also available in settings as diverse as hospitals, nursing homes and the military. While chaplains are ordained within a specific denomination, they may end up coordinating faith-based services for Christians from a wide variety of traditions. Other important leadership roles can be found in humanitarian work, such as social welfare agencies or NGOs. Some of the humanitarian work might be based in a para-church organization, such as World Vision, while other programs may not be faith-based, but would still provide work a Christian leader may feel compelled to do. Work in these types of organizations include administrative and support roles as well as direct relief and medical work. The broad diversity of jobs available to Christian leaders reflects the diversity found within the Christian tradition. Whether you feel called to teach, preach, administrate, work cross-culturally, serve as a relief worker, missionary, doctor or nurse, there is plenty of faith-inspired and faith-shaped work available. These are just some of the types of jobs available in Christian leadership.